"'Finding a 105-year-old who's lived in each location and asking them which hurricane they think was the worst' is left as an exercise for the reader." Super-delayed edit: True enough for us, I guess. Though thanks to Irene knocking out our power a year before it, we kept ours through all of Sandy. Not sure whether I should be glad or disappointed that there weren't any more impressive ones in the early-to-mid 1900s that I missed. Last edited by SomeGuyNamedDavid on Mon Aug 18, 2014 5:10 pm UTC, edited 1 time in total. sniped - but no comment. Unsporting. My worst "hurricane" was Typhoon Freda in October 1962, age 9, near Portland Oregon. "some reports put the peak velocity at 179 miles per hour (288 km/h)". Blew out the walls of the gym at the grade school - since I hated gym, this was a plus. We ate meals cooked on the woodstove-like fireplace for days until the power came back on. Most men my father's age spent the week afterwards picking up rubble instead of going to work - we kids picked up little stuff. Rebuilding a greenhouse for the backyard now, with that storm in mind. The pre-rebuild greenhouse may have been built from salvage from the 1962 storm. Our next big disaster may be a Cascadia Subduction Zone earthquake. It will probably topple most of the tall buildings in Portland, and just about everything built with brick before 2000 AD, when the building codes were updated to reflect new geological discoveries. The last one in 1700 caused a 30 meter tsunami that wiped out most of the coastal tribes, killed dozens as far away as Japan, and dropped a cubic mile of mountain into the Columbia river. Hurricane, schmurricane. Last edited by keithl on Wed Aug 13, 2014 5:00 am UTC, edited 1 time in total. Thank you for the explanation, yeah, first thread starters can be confusing. Go ahead and use the EDIT button to add a comment now. Welcome to the forums! Perhaps we should develop a 'bot that automatically snipes everybody, with some totally irrelevant comment, so we do not collide at the head of the thread. Eliza-bot: "Why do you think that 'Finding a 105-year-old who's lived in each location and asking them which hurricane they think was the worst' should be left as an exercise for the reader?" The area where I grew up is on the border between Agnes (before my time) and Isabel (which occurred after I left for college). Where I went to college is in the Ivan zone, though I only vaguely remember it (I seem to remember the local TV station making a big deal about it, then it rained a little). Where I'm living now is outside the area covered by the map, but I remember when the remnants of Tropical Storm Erin passed by and, somewhat unusually, strengthened quite a bit while it was passing over dry land. And one of the biggest memories I have of a hurricane was from Hurricane Fran in 1996. I was returning from a fishing trip with my dad, and we as we drove over the Cheat Lake Bridge in West Virginia I remember looking down and seeing boats that had been tossed around by the storm. We actually drove through the storm further north, but I slept through it in the back seat. Looking back through the hurricanes whose remnants have affected Oklahoma, it looks like the worst here was one with perhaps the best hurricane name ever: Hurricane Paine. So which are worst on average, the boy hurricanes or the girl hurricanes? keithl wrote: Eliza-bot: "Why do you think that 'Finding a 105-year-old who's lived in each location and asking them which hurricane they think was the worst' should be left as an exercise for the reader?" I would love to see an Eliza-bot firstposter. Worst hurricane that I remember: None, because I don't live in the US and I am not an American. alvinhochun wrote: Worst hurricane that I remember: None, because I don't live in the US and I am not an American. Nor do/am I, but mine is the Great Storm of 1987. It wasn't strictly a hurricane because of a technicality, but was hurricane-force. At the time, I was living in the north-west of England, which escaped largely unscathed, and the prevailing feeling was that the whole thing was being exaggerated by the London-centric news media and that it was typical of those southern softies not to be able to handle a bit of wind. It was only when I moved south a few years later that I understood what a big deal it was: apart from the serious and lasting damage to the landscape and property, 22 people had died in the storm. A northern ex-pat in London, I still feel conflicted regarding media coverage: probably there is a bias, but just because something is only affecting the south-east of England doesn't mean it isn't important. Cyclone Tracey. Same as everyone else in 'Straya. There was that other one recently that I think was pretty bad, but I can't remember its name. Therefore it's not one I remember. It makes me wonder: are there any devestating hurricanes/tropical cyclones outside of the U.S.? ...but I can't remember any news about tropical storms hitting Polynesia/Micronesia/Australia/the Philippines/Japan. Shouldn't this just be a map of the entire contiguous United States with the word "Katrina" stretching across it in huge letters? Flumble wrote: It makes me wonder: are there any devestating hurricanes/tropical cyclones outside of the U.S.? There was the one that destroyed the middle of the Philippines recently (2013, named Haiyan). Maybe the less extreme ones are too common there? What news outlets do you follow that didn't cover that one? PinkShinyRose wrote: There was the one that destroyed the middle of the Philippines recently (2013, named Haiyan). Maybe the less extreme ones are too common there? What news outlets do you follow that didn't cover that one? Oh right, that was because of a hurricane. The thing I remember about that disaster was the vast amount of damage and the sheer number of charity fundraisers, not whether it was a flood, tsunami or a hurricane. Indeed, I don't watch the news outlets much –mostly the newspaper (volkskrant), conversations with housemates, and, when I'm at my parents', the evening broadcasts (NOS). Looking in the archives of the NOS, I do see coverage of quite a few tropical cyclones, including the anual ravaging ones over the Philippines. Last edited by Envelope Generator on Wed Aug 13, 2014 12:36 pm UTC, edited 1 time in total. Apparently it was a typhoon. According to The Great Wiki, typhoons and hurricanes are the same thing in different places. So you were sort of right in a sense: they don't have hurricanes because they call them typhoons. Worst I remember was typnoon Pamela while living in Ipan, Guam in '76 ... (Island is sometimes called "The Typhoon Magnet of the Pacific) Wasn't there for Karen in '62 which was worse (280 km/h) but Pamela was good enough. I8 hours of typhoon force winds (>118 km/h) with a peak of 150 km/h for around 6 hours. Roof stayed on the house until the eye went over... Winds dropped from around 130 km/h to 0 in a couple of minutes. Popped the roof off like a tiddlywink. Waited out the rest at a neighbors house. It did get a bit breezy in Birmingham once, but that's the closest England are going to get, I suspect. Two squiggles on that map caught my attention. I found the lonesome one off Brazil but what's the one that made it all the way to James Bay? I can't find anything that resembles it on Wikipedia. The Hurricane Hazel area should be extended further north - it was still a hurricane when it hit Toronto and killed 81 people. I do remember Opal being a thing when I was a kid, but I was so far north(Toronto area, as you may have guessed from the above comment) that it was really just another thunderstorm. I was surprised that most of Western NY is Hazel and not Agnes. Both were before my time, but I've never heard about Hazel before. I've heard a lot more about Agnes -- mainly because the floodwaters on the Genesee River reached within inches of the top of the Mt Morris Dam. Had the Dam not been there, Agnes would have caused at least $210 million in damages (in 1972 dollars) to the city of Rochester. I didn't realize Hugo would have such a large area. It's been 25 years. I live in eastern North Carolina and Rocky Mount, Tarboro, Greenville and most of the area from Wilmington to Roanoke Rapids was DEVASTATED by Floyd in 1999. BILLIONS in damages and lives destroyed by 500 year flooding. Hazel is NOT remembered anymore and was about 1/3 less damaging than Floyd. Rocky Mount alone got 14" of rain in less than 24 hours. Last edited by firelight on Wed Aug 13, 2014 2:30 pm UTC, edited 1 time in total. Accurate both for the area I grew up in (Sandy), and the area I live in now (Fran). I'd like to see what it would have been for the NY metropolitan area pre-Sandy. My guess would be Floyd. While Gaston definitely qualifies as the most devastating storm in memory in Richmond, VA, it wasn't a hurricane at that point. It wasn't even a tropical storm. It was all the way down to a tropical depression. In other words, almost no wind, just about a foot of rain in less then 10 hours. I'm going to make a guess that this was based solely (or mostly) on the amount of rain that fell from each particular storm, based on the title of the chart. If so, I've got a nitpick, because that really doesn't characterize the "worse-ness" of a particular storm. Ivan, for instance, produced 118 tornadoes along his path, which would likely render him the worst in the eyes of a lot of people in the Florida Panhandle, NE Georgia, and NE Virginia. algorerhythms wrote: Where I'm living now is outside the area covered by the map, but I remember when the remnants of Tropical Storm Erin passed by and, somewhat unusually, strengthened quite a bit while it was passing over dry land. As a tropical cyclone researcher, I dig this map. I could nitpick and second-guess both the comic and myself for hours, but taken at face value it seems quite accurate for most regions. There are a few randbob storms ("King" '47, 1941 in TX) that, while perhaps quantitatively the rainiest or most intense at a particular location, few people are ever going to remember, let alone revere as the worst in recent history. That said, it's always tough to guess what people are going to consider the "worst" based on hard data alone—there is always a recentism bias when it comes to natural disasters, for example. Worth noting that Esther actually occurred in 1961, not '51 as indicated in the comic. jalohones wrote: Cyclone Tracey. Same as everyone else in 'Straya. Monica in 2006? That cyclone struck the Top End as a much stronger storm than Tracy, but further to the east so as to avoid Darwin. The Philippines are frequently hit by intense typhoons, some of which cause large amounts of damage (as previously mentioned). Taiwan and Southern Japan are also frequently hit by typhoons, but are generally much better prepared for them, so casualties are normally low. Typhoon Halong just hit Japan a few days ago, and killed 10 people. Typhoon Neoguri in July killed 3. South Korea is hit by a couple of typhoons a year, but fatal ones only every decade or so; sometimes tropical storms hit North Korea - these are normally weaker, but can cause far higher casualties both from landslides/flooding and from destroyed crops leading to famine. Cyclones hitting the Eastern coast of India and Southern Bangladesh have caused colossal casualty numbers in the past. Last edited by Adacore on Wed Aug 13, 2014 3:16 pm UTC, edited 4 times in total. Camille took out 25% of our Pecan Orchard and left destruction in Biloxi/ Gulfport for most of my childhood. Frederic took out another 40% of what was left of the Pecan trees, destroyed my uncles house . Katrina washed out my downstairs and made me refurb the house to a single upper story with a screened porcgh underneath. Living near Harrisburg, I have to say Agnes is the one everyone talks about. Eloise barely gets a mention. Hazel, Ivan, and Sandy were all pretty bad, but it's always Agnes. But still an awesome map. I was trying to post some URLs, but every time I did, I got flagged as spam, so I'll leave it as an exercise to the reader to find pics, etc. Accuweather has a great gallery of the destruction. roband wrote: It did get a bit breezy in Birmingham once, but that's the closest England are going to get, I suspect. Despite my interest in the topic, I have no first-hand experience with tropical cyclones. Up here in Minnesota it's just tornados, derechos, blizzards, floods, and other various less exciting forms of extreme weather. So did someone (or several someones) actually do a survey to learn what storms are "memorable" across this area? My wife is highly skeptical. She thinks that the "anyone in your town remembers" is just a journalistic attention-getter, and the map actually only shows the worst (presumably meaning the one with strongest winds) storm recorded in each area. She concludes this from the fact that two databases of storm data are referenced, but no actual survey database is mentioned. saurgoth wrote: Shouldn't this just be a map of the entire contiguous United States with the word "Katrina" stretching across it in huge letters? 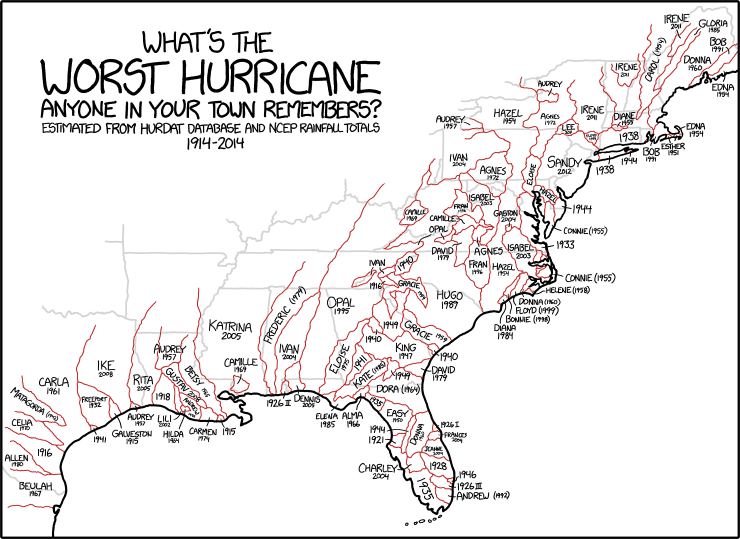 It's basically a map of what was the worst hurricane that hit that particular area that people alive could remember. Katrina may have been the worst overall, but it didn't hit the East Coast, so it's not the worst hurricane that hit the East Coast areas. Alsadius wrote: The Hurricane Hazel area should be extended further north - it was still a hurricane when it hit Toronto and killed 81 people. NCEP and HURDAT are US agencies, so they likely don't have data on Canada. The lines almost all stop at the Canadian border, with only a few straying in. Not sure if those are conjecture, or if the agencies have data for some parts of Canada near the border on some hurricanes. LtPowers wrote: I was surprised that most of Western NY is Hazel and not Agnes. Both were before my time, but I've never heard about Hazel before. I've heard a lot more about Agnes -- mainly because the floodwaters on the Genesee River reached within inches of the top of the Mt Morris Dam. Had the Dam not been there, Agnes would have caused at least $210 million in damages (in 1972 dollars) to the city of Rochester. Hurricane Hazel happened in 1954, so Agnes is more recent in most people's memory, and likely is simply remembered by far more people; for everyone younger than 60, Agnes would be the worst. Remember that the map's title is "what's the worst hurricane that anyone in your town remembers?" not "what's the worst hurricane most people in your town remember." jc wrote: So did someone (or several someones) actually do a survey to learn what storms are "memorable" across this area? My wife is highly skeptical. She thinks that the "anyone in your town remembers" is just a journalistic attention-getter, and the map actually only shows the worst (presumably meaning the one with strongest winds) storm recorded in each area. She concludes this from the fact that two databases of storm data are referenced, but no actual survey database is mentioned. 1) There's someone old enough in your town to have lived through the hurricane and remember it (the caption appears to consider the age of 5 as being the threshold for remembering the event). 2) That person was living in the town at the time of the hurricane. Also, this site isn't journalism, it's a comic. This map is more of a thought experiment than a genuine attempt to suss out memories of hurricanes in the population. I'm still pretty convinced that severe snowstorms/blizzards/ice storms are responsible for more deaths and damage in a year than hurricanes. It's quite difficult to find data on blizzard casualties, but I know that every year in southern Ontario there are dozens of people that die in weather-related car accidents during storms. That's not including people who die from exertion or heart-attacks trying to remove snow, from being stranded in extreme cold, from losing power to medical devices, etc. Then the icing on top is when all the snow melts in April or May and rivers start blowing their banks. Of course, this leads to one of the coolest things I've ever heard of - where they literally blow up the Ottawa river with dynamite every spring to prevent ice blockages causing severe floods! The worst I remember were right after that asteroid hit near Yucatán. The atmosphere was a mess for years! Can anybody identify which hurricane should be marked on North Carolina, in the blank spot to the east of Isabel?